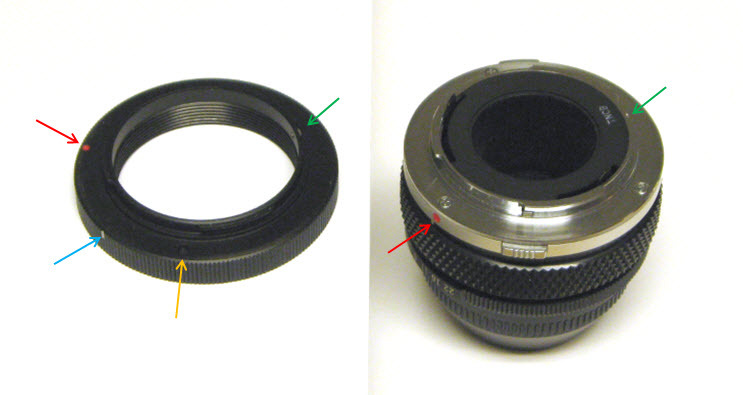 www.photomacrography.net :: View topic - adapter for microscope lens to OM mount? adapter for microscope lens to OM mount? Looks like a good option. Mix'n'Match. I like it! I had a vague recall of finding a solution on their website but a visit this morning failed to find a solution. So I Googled it and found my original post. The body is willing but the mind is weak! Hahahaha! Thanks for the early morning smile! The M42 adapter that I currently have has always been fiddly to get lined up for insertion into Olympus bellows. It fits fine once it's in, though. I've always assumed it was just manufactured a little bit off (it was a preproduction prototoype that somebody gave to me), but now I'm wondering if it's actually built to four-thirds spec instead of OM. Interesting question! That adapter I linked is a cheap part ($3.87 with free shipping), so I've ordered one just to satisfy my curiosity. eBay says it'll come in a week or so. The adapter came today. I was happy to discover that it fits fine, meaning that it inserts easily into the front of the bellows and turns to lock as a fit that is snug but doesn't seem dangerously so. However, "discover" is definitely the right word. When I tried to insert the adapter with the red dots lined up as for my Olympus bellows lenses, it wouldn't go in at all. After some investigation and a bit of good luck, I found that the adapter inserted easily if simply turned about 55 degrees from where the red dots would suggest. Comparing against my Olympus 38 mm bellows lens, it's clear that the four-thirds adapter has its red dot in a different position. The workaround is simple of course. Remark the adapter with a bit of paint on the side. Is this consistent with anybody else's experience? I'm not sure if this helps but it is factual. I have just examined my Olympus m4/3 and OM cameras and lenses. In both cases the red dot on the camera body is at about 10 o'clock on the camera flange. Also, the red dot on a lens/adapter/tube is at 12 o'clock when locked on. This also applies to my M42 to OM adapter (the one without the rear correction lens). Things are different with my Leica-R lenses, where the insertion (dot not marked on my adapter) is at nine o'clock (at the position of the release button) and the locked postion at 11 o'clock. This gives some scope for error in a small, mixed-mount production line. OK, that's what I'd expect. But here's my question again, in more visual terms. On the left is my just-delivered M42 to four-thirds adapter. 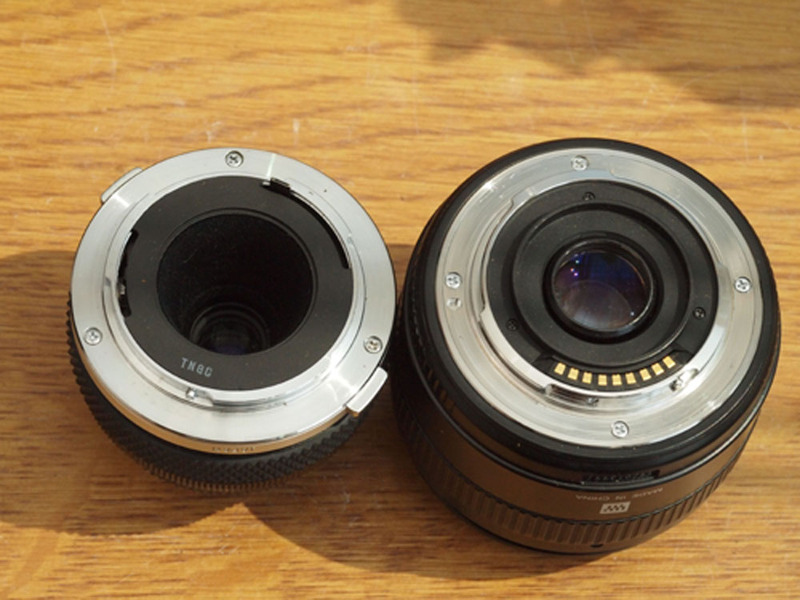 On the right is a Olympus bellows lens. Green marks the location of the stop pin. Red points to the red dot. Blue points to the new mark I had to make on the four-thirds adapter, to play the role of matching against the red dots on the front of the bellows. Orange marks the location of what looks like a locking slot in the new adapter, completely missing on the bellows lens. 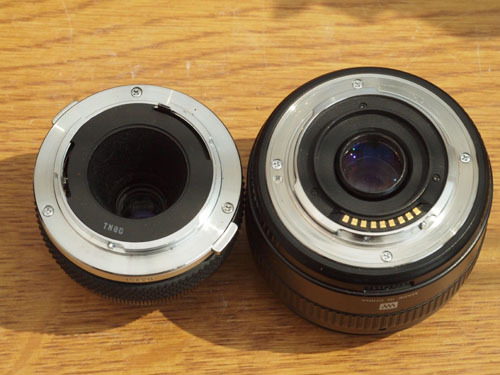 The question I have is whether the four-thirds adapter accurately represents the configuration of a four-thirds lens, or whether there's something odd about this adapter. Adding some information, I checked the configuration of the new four-thirds adapter against my older no-name no-spec adapter. They match, except for what seems to be some difference in manufacturing tolerances that lets the new adapter mount without difficulty while the older adapter is fiddly to get inserted. The older adapter seems to be a completely independent design, so I'm thinking that the adapters are both four-thirds and that indeed the four-thirds mount differs from the OM mount in the relationship between the red dots and the tabs & stop pin. I don't know anything about the micro-four-thirds mount. Sorry. Nobody talks much about 4/3 these days so I jumped to m4/3. The red, green and orange items coincide. Orange (oval recess) is +/- 90 degrees from the red dot; green (stop screw) is about 140 degees from red dot. The red dot on front (4/3) of 4/3 to m4/3 adapter is as for OM or m4/3 (about 10 o'clock). Red dot on 4/3 lens has to be aligned with red dot on mount to insert and is at 12 o'clock when locked. This suggests something non-standard in your mount. When it comes to comparing the bayonet mounts (male on lens) for OM and 4/3 they are almost opposites: where there is a part-circle flange on one there in none on the other, such that it is rotated by 60 degrees or so (a guess!). If this has not totally confused you I hope it is of some help. [Edit] A cross-eye stereo pair, straight from the camera (rush job, I am on child care duty). OM 38mm bellows on left, 35mm macro 4/3 on right. Both as on camera i.e. red dot at (approx.) 12 o'clock. what you have is almost certainly a 4/3 adapter. Many of these adapters are incorrectly advertised as "OM compatible" on eBay, but OM is properly only applied to the Olympus film SLR system, not the 4/3 nor the Micro 4/3. Both the 4/3 and the Micro 4/3 male bayonets have what I would call a Nikon-style recess at 3 o'clock (looking toward the camera female bayonet) where the locking pin clicks in. 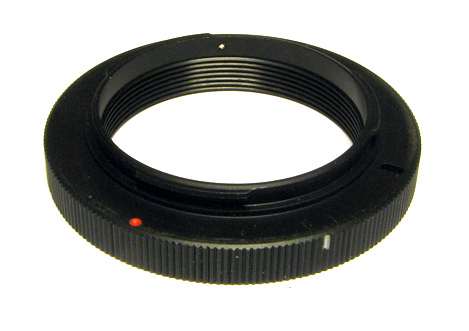 As your picture of the Olympus OM lens shows, the male OM bayonet has instead a locking tab that springs radially outward to lock into a notch machined into one of the three female bayonet flanges at approximately 1 o'clock. The 4/3 and Micro 4/3 male bayonets are geometrically similar, but the Micro 4/3 has a diameter a few mm smaller and there is no way to lock a Micro 4/3 lens into a 4/3 camera (or vice versa). I also find it impossible to fit an OM lens into a 4/3 female bayonet (the only one I have at hand is a Panasonic 4/3 to Micro 4/3 adapter). I don't have any male 4/3 bayonet at hand to try fitting it into an OM female bayonet, but it might work the way you found (except of course it should not lock). Edit: I did find a 4/3 male bayonet, and there is no way to insert it into a (genuine) female OM bayonet. The bayonet flanges are always in the way along the whole 360 degrees rotation. Your adapter is probably machined slightly out of specs. I don't have any male 4/3 bayonet at hand to try fitting it into an OM female bayonet, but it might work the way you found (except of course it should not lock). It won't go. You would have to take quite a lot of the clockwise end of the top bayonet flange. See my stereo pair inserted as Enrico was posting. So, what I have are two adapters, both made to 4/3 spec, but one of them having at least one smaller tab that lets it also work with an OM mount by mismatching the red dots appropriately. "Tab", the word I needed! For some time I have been using OM plastic body caps on 4/3, there being just the tabs and nothing else to limit use. Unfortunately, "OM" is used incorrectly for most of the adapters on Ebay where 4/3 should be specified. Of course, apart from potential use on extension tubes, bellows and suchlike, there is no point in being able to attach OM mounts to 4/3, as the flange to sensor distance is about 7.3mm too short. (In passing, the M42 lenses on OM need a reduction of 0.5mm, hence the correction lens for distant focus).